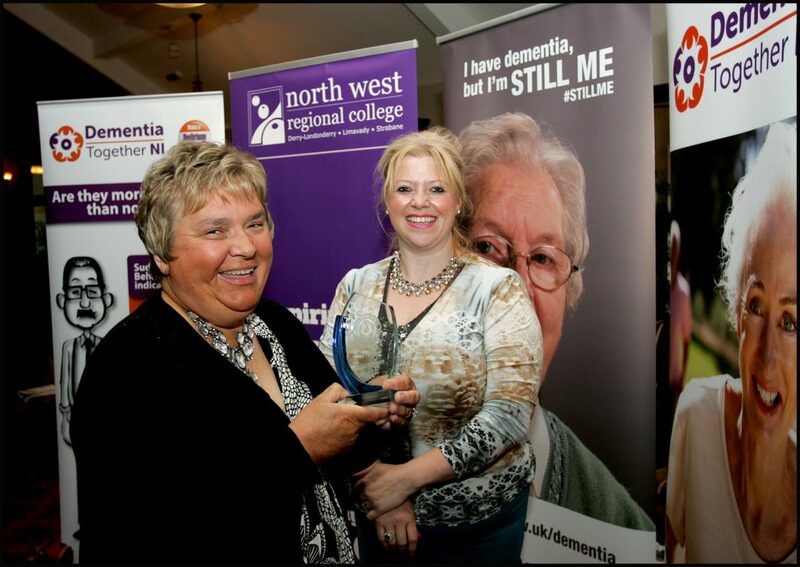 NI Dementia Champions of Champions attending the recent NI Dementia Champions Graduation Ceremony in Antrim. 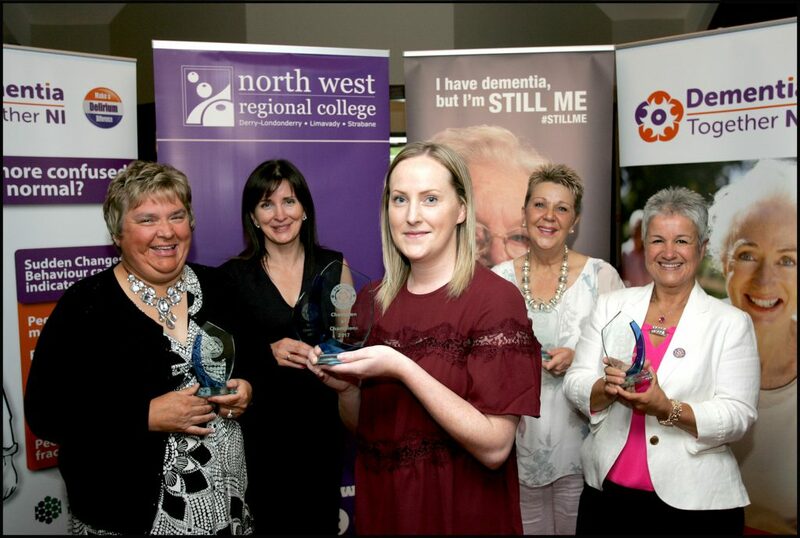 Pictured with their Champion of Champions awards (from L-R) are Anne Holmes, Southern Trust Area Champion, Briege McNally, Western Trust Area Champion, Helen McCullough, NI Champion of Champions, Sharon Doey, Northern Trust Area Champion and Palmira Valente, South Eastern Area Champion. Also successful, not in attendance, is Kate Russell, Belfast Trust Area Champion. The graduates received their Champion of Champions commendations for work undertaken through participation on the Dementia Champions Training Programme. The Dementia Champion awards are recommended by course lecturers based on graduates’ contribution, enthusiasm and overall attainment in the submission of their work-based assignments as well as their attendance and engagement during study days. 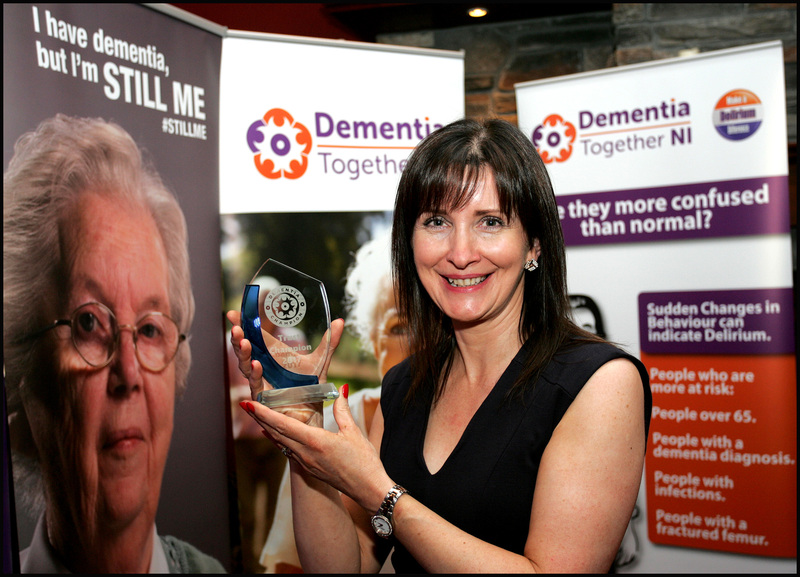 There is one Dementia Champion award available per Trust area and one overall regional NI Dementia Champion of Champions award. 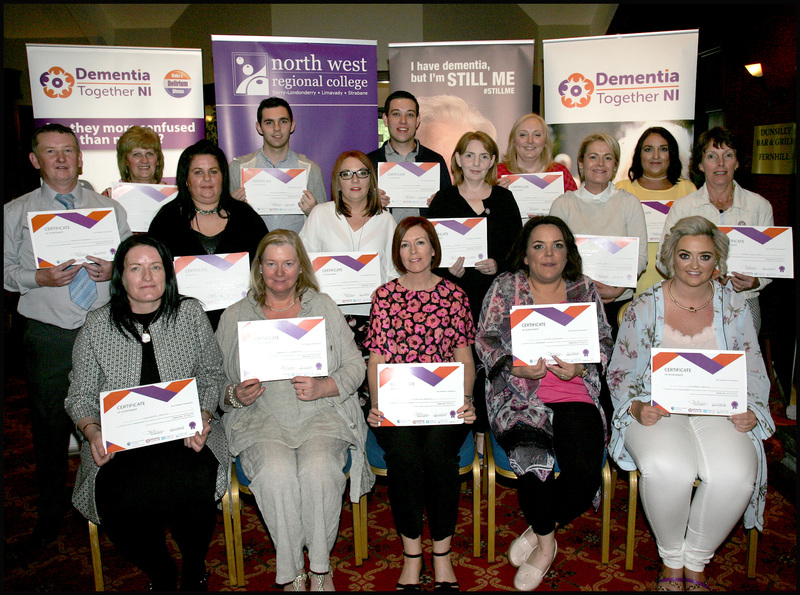 Graduates from Northern Ireland’s third cohort of Dementia Champions were recently honoured at a graduation ceremony held in Antrim. 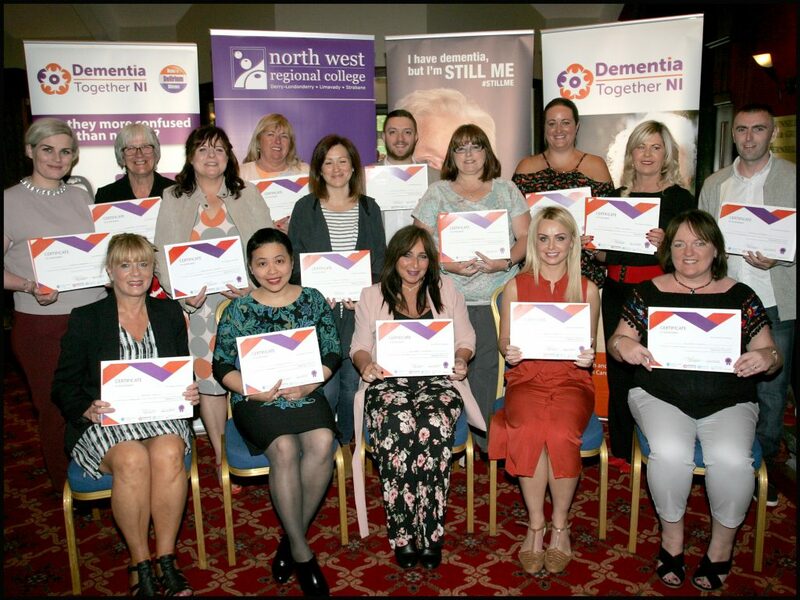 The graduates, health and social care staff from across NI who work in Health and Social Care Trusts and in the independent care sector, were successful in completing the Dementia Champions Programme in professional dementia care. For more details of the Dementia Champions programme click here. 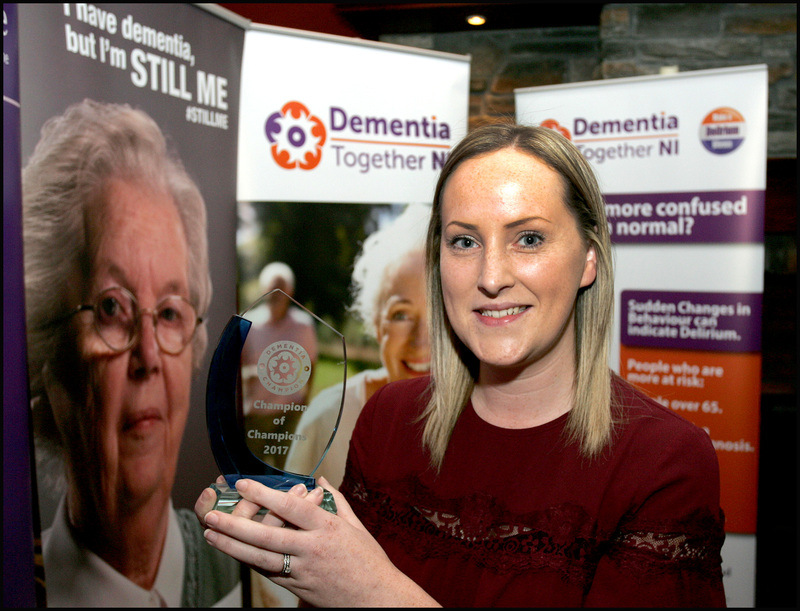 Pictured at the recent Dementia Champions Graduation Ceremony Helen McCullough from the South Eastern Health and Social Care Trust with her Northern Ireland Champion of Champions Award. Helen, who works at Lagan Valley Hospital, received the commendation for her work undertaken during her participation on the Dementia Champions Training Programme. Claudine McComiskey, Head of Domiciliary Care at the Southern Trust, congratulates Anne Holmes, the recipient of the Southern Trust Area Champion of Champions award. Anne, who works at Trust Homecare at Drumalane House in Newry, was awarded the Southern Trust Champion commendation for the excellent work she undertook through her participation on the Dementia Champions Training Programme. 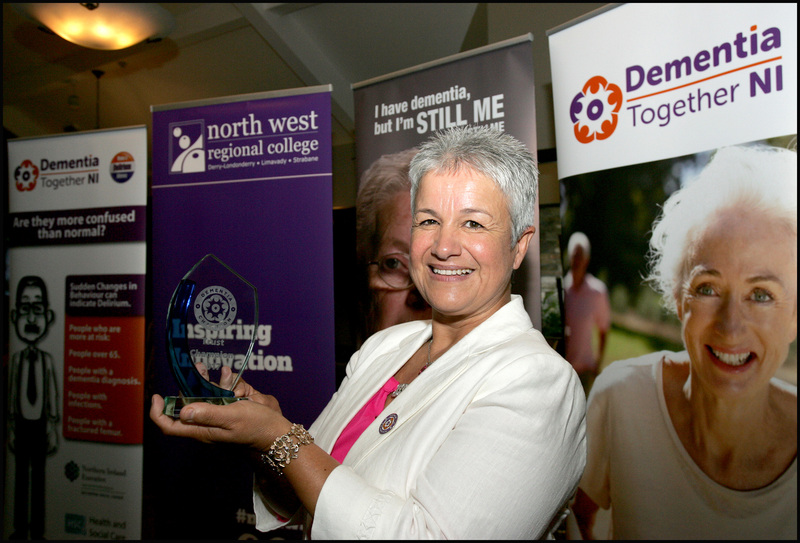 Palmira Valente, pictured at the recent NI Dementia Champions Ceremony, with her South Eastern Trust Area Champion of Champions award. Palmira, who works at Laurelhill House Care Home in Lisburn, received her commendation for the excellent work undertaken through her participation on the NI Dementia Champions Training Programme. 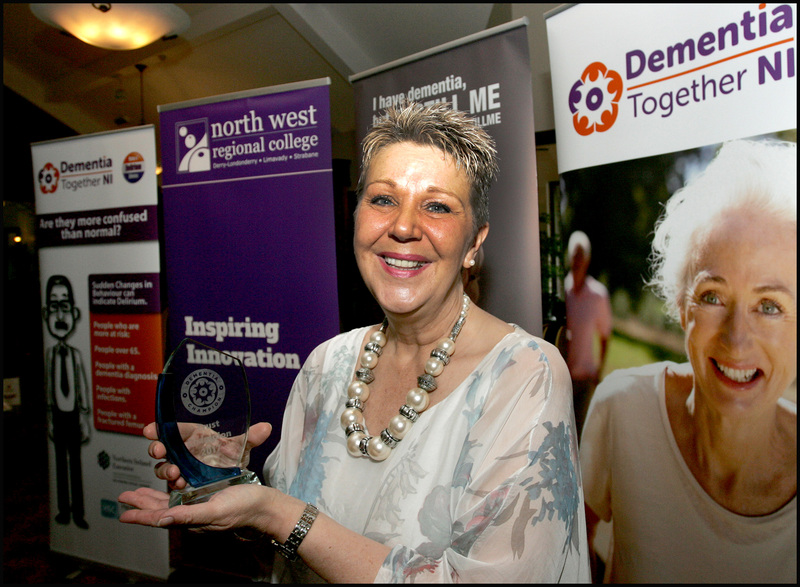 Pictured at the NI Dementia Champions Ceremony is Sharon Doey, the recipient of the Northern Area Champion of Champions award. Sharon, who works at Andena Care Home in Ballymena, was awarded the Northern Trust Area Champion commendation for the excellent work she undertook through her participation on the Dementia Champions Training Programme. 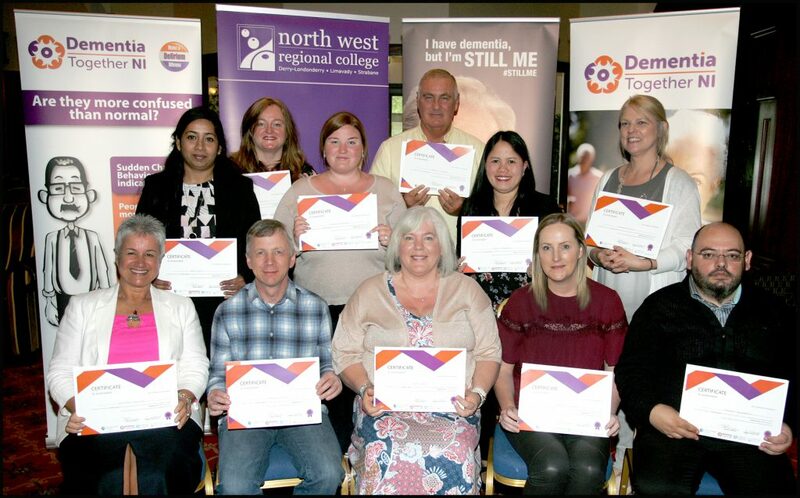 Attending the recent NI Dementia Champions Graduation Ceremony, are the third cohort of graduates from the Belfast Health and Social Care Trust area. Graduates pictured are Geraldine Gallagher, Janet Sewell, Olive Watson, Tracy Letters, Agnes Lamey, Regina Brady, Michael Cupples, Gillian Dowd, Mary Crymble, Amanda Corbett, Bernadette Burrows, Christine McColgan, Shelagh NíCaughan, Linda Hamilton, Daniel McCrea and Leona Larkham. Successful graduates not in attendance are Margaret Tanuvasa, Kate Russell (Belfast Trust Dementia Champion of Champions), Claire Smyth, Mark Kelly, Michelle Powney, Irene Best and Julie Davidson. Graduates from the Northern Health and Social Care Trust area pictured attending the third Dementia Champions Graduation Ceremony. Successful graduates from the Northern Health and Social Care Trust are Jim Armstrong, Ashley McFall, Paula McLaughlin, Wendy Houston, Marielle White, Megan Scullion, Christine Chambers, Tanya Dallas, Arlene Workman, Pauline O’Kane, Lorraine Hull, Carla Walker, Jessica Moore, Claire McClelland, Colleen Hampson, Linda Cairns, Sharon Doey (Northern Trust Area Champion of Champions), Pamela Mc Dermott, Muriel Stringer, Mary Crymble, Joanne Sweeney and Victoria Loftus. 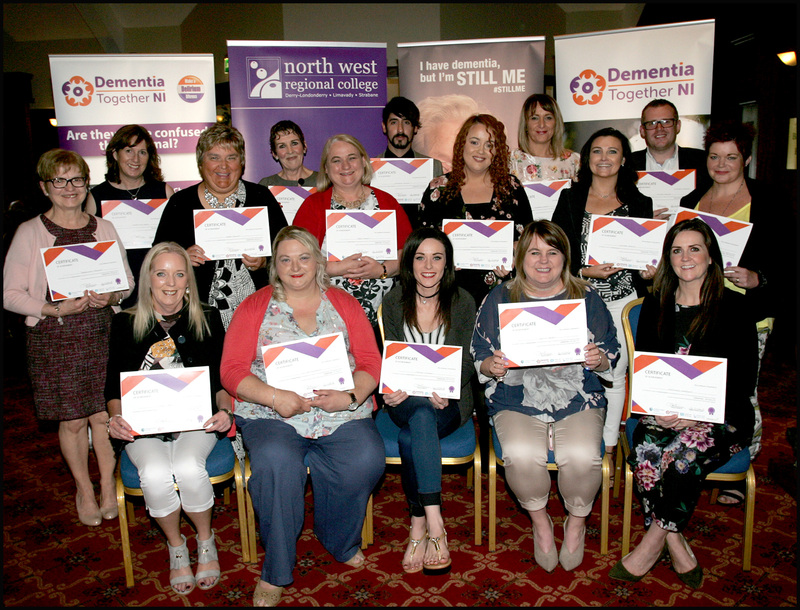 Picture 1: Graduates from the Western Health and Social Care Trust area pictured attending the third NI Dementia Champions Graduation Ceremony. Successful students from the Western Health and Social Care Trust area are Ellen Nash, Karen Harkin, Geraldine McTernan, Máire O’Hara, Carmel Darcy, Emma O’Donnell , Karen Fullerton, Caroline Gibney, Anne Hamilton, Natasha Blair, Adrian Sharkey, Collette Payne, Cathy Harkin, Laura McGinley, Jonathan McCrabbe, Keilith Humprey, Shannon Devine, Roisin Devine, Karen Middleton, Shauna McConomy, Anabella James, Wendy Hyndman, AnneMarie Nixon, Letitia McGilloway, Brigit Watson, Liz Brennan, Breige McNally (Western Trust Area Champion of Champions), Brenda Doherty, Emma Hall, Tony Sweeney, Ciara McHugh, Jenna Nutt and Samantha Magee. 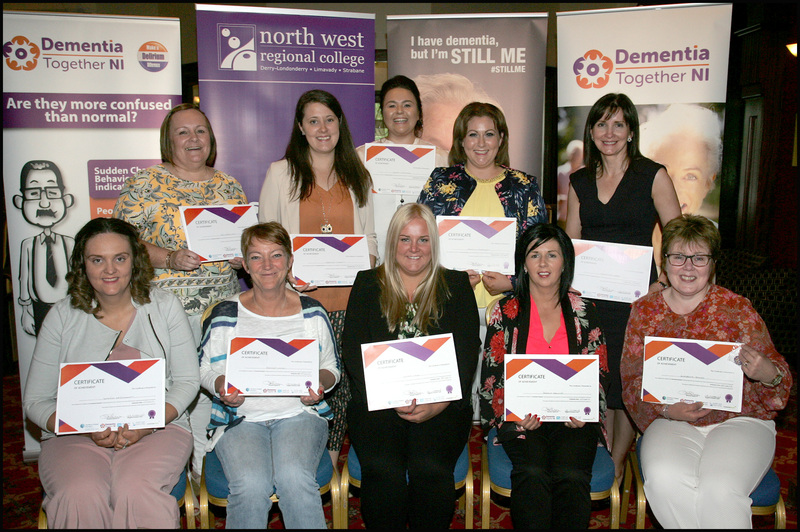 Picture 2: Graduates from the Western Health and Social Care Trust area pictured attending the third NI Dementia Champions Graduation Ceremony. Successful students from the Western Health and Social Care Trust area are Ellen Nash, Karen Harkin, Geraldine McTernan, Máire O’Hara, Carmel Darcy, Emma O’Donnell , Karen Fullerton, Caroline Gibney, Anne Hamilton, Natasha Blair, Adrian Sharkey, Collette Payne, Cathy Harkin, Laura McGinley, Jonathan McCrabbe, Keilith Humprey, Shannon Devine, Roisin Devine, Karen Middleton, Shauna McConomy, Anabella James, Wendy Hyndman, AnneMarie Nixon, Letitia McGilloway, Brigit Watson, Liz Brennan, Breige McNally (Western Trust Area Champion of Champions), Brenda Doherty, Emma Hall, Tony Sweeney, Ciara McHugh, Jenna Nutt and Samantha Magee. Graduates from the Southern Health and Social Care Trust area pictured attending the recent Dementia Champions Ceremony. Successful students from the Southern Health and Social Care Trust are Marie Vallely, Clare Byrne, Trea Connolly, Maureen Currie, Oliver Mc Girr, Helena O’Hanlon, Adele McRann, Veronica Kerr, Ciara Burke, Frances Haughey, Rosemary Stewart, Fiona Greene, Lynne Mc Nally, Niamh O Hara, Anne Holmes (Southern Trust Area Champion of Champions), Donna Hogan, Brenda Haughey, Helen Armstrong, Brenda McCann, Louise Taylor and Orla Murray. Included also in the photograph is Emmette Dillon from Belfast Health and Social Care Trust. 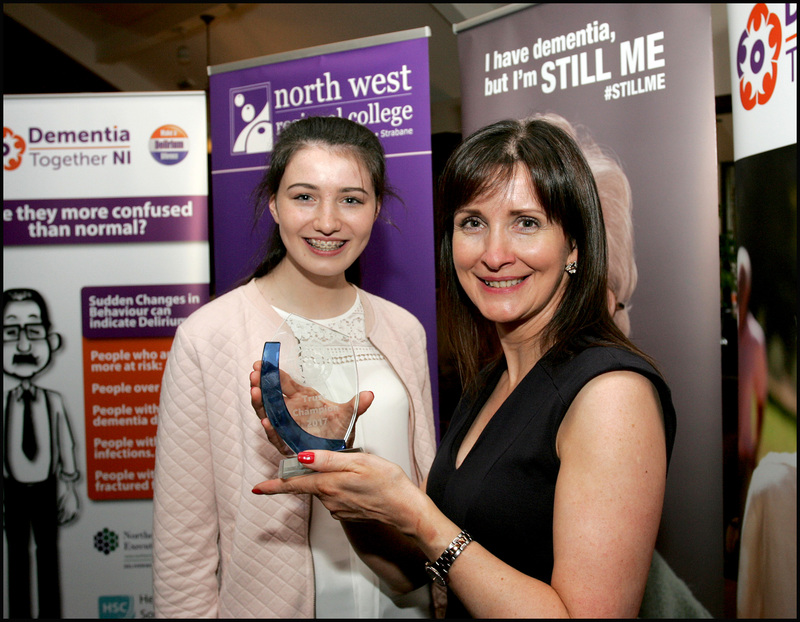 Brighdín McNally congratulating her mum Briege McNally on her achievement in receiving the Western Trust Dementia Champion of Champions award. 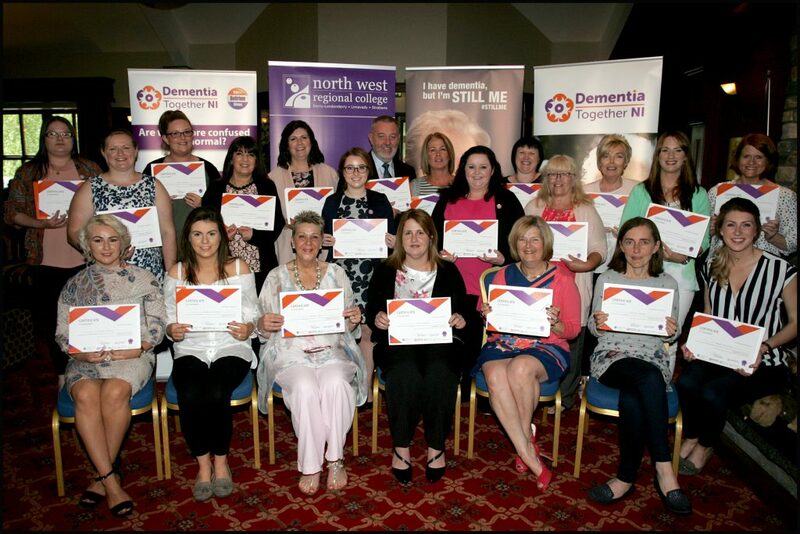 Graduates from the South Eastern Health and Social Care Trust area pictured attending the third NI Dementia Champions Ceremony. Successful students from the South Eastern Health and Social Care Trust are Desmond Maguire, Fiona Brennan, Fionnula Mann, Palmira Valente (South Eastern Area Champion of Champions), Leah Stewart, Ann Burns, Virgilia Guevarra, Mini Davis, Helen McCullough (Northern Ireland Champion of Champions), Dragan Milofhevski, Stephen Mulhern, Tracey Higney, Laura Dempsey, Brigid Dorrian, Michelle McSherry, Emma Hannah, Gloria Trouba, John McGregor, Karen Heasty, Janine Drake and Emma McQuillan. 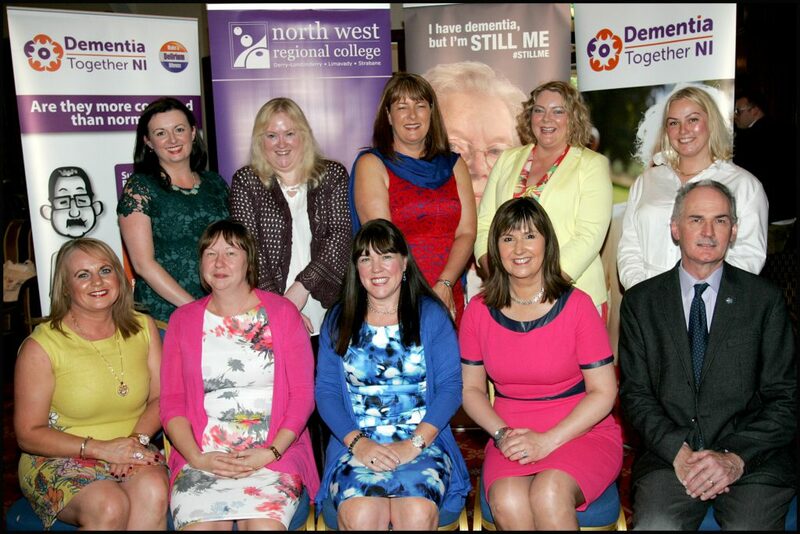 Event organisers, speakers and funders pictured at the third NI Dementia Champions Graduation Ceremony are back row (from L-R) Louise Henry, North West Regional College, Teresa McGarvey, Health & Social Care Board, Seamus McErlean, Health & Social Care Board and Eleanor Ross, Public Health Agency. Front row (from L-R) Julie Cordner, Connected Health, Lorna Conn, Health & Social Care Board, Trea Connolly, Southern Health and Social Care Trust, Mary Hinds, Public Health Agency and Angela Hodgkinson, Atlantic Philanthropies. The NI Dementia Champions Programme lecturers and facilitators from education and health sectors. 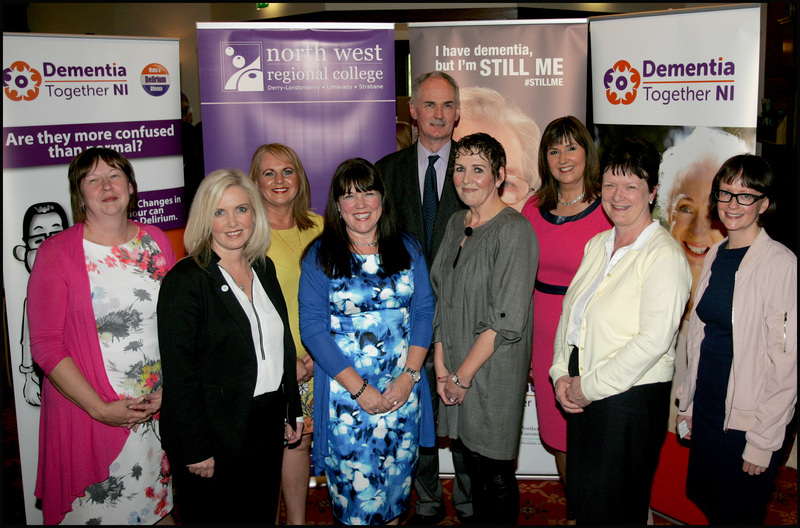 Staff pictured are from the Health and Social Care Board, North West Regional College and the Public Healthy Agency.